Early in 2009 I read Sharon Hinck's "The Restorer" and absolutely fell in love with the characters. Susan Mitchell, an ordinary and slightly burnt-out soccer mom, unknowingly steps through a portal in her attic and is transported into another world and onto an incredible journey. When I received the opportunity to review an advanced copy of this Expanded Edition I was very thrilled to accept and see what Sharon had added to the story. "The Restorer" and both of its sequels are really unique and interesting tales. The world that Susan steps into is different than ours in many ways, and although some people there worship the One God, creator of the universe, their Redeemer has not yet come. They are still waiting. I'm so thankful we already have Jesus and we can put our faith in Him. Yet it is fascinating that their One God and our One God are the same! This plays an important part in Susan's journey. The plot of "The Restorer" is rich, with lots of unexpected turns. You'll make new friends and learn with Susan that God has not forgotten about any one of us and He does indeed have a plan for our lives, even though they may seem foreign and unusual to us. If we're willing to follow Him, He'll give us more of an adventure than we ever dreamed possible. In this Expanded Edition, Sharon brings us new scenes, a detailed devotional guide, and much more. While "The Restorer" is given to us entirely from the first-person account of Susan, the new additional scenes come from the perspective of other characters, adding depth, insight, and interest to the story. I found the devotional guide to be really neat and far more than a list of discussion questions. All ten devotionals are very thought-provoking and Scripture-based. My favorites were #6, #7 and #8. I would highly recommend "The Restorer - Expanded Edition" and hope that we'll soon see an Expanded Edition for each book in this trilogy. Many thanks to Jamie from Sharon Hinck's office for my copy of the ARC. All opinions expressed in this review are my own. My awards for books I most highly enjoyed in 2011. Please click on the title to read my original review. Three girls in 1918 Boston. I couldn't put this book down! This is a needed and relevant novel that asks gentle yet confronting questions about the darker side of Christian conservatism. This book impacted me so much that I was *this* close to leading a Bible study on it. The Lord led in another direction in the end, but I really benefited from this book and would recommend it to every Christian woman who wants to live as a victorious warrior for the Lord. Earlier this year I wrote about some of my favorites on my bookshelf, the Mars Hill Classified trilogy by Austin Boyd. Those were the author's first releases and I've kept an eye open for any others over the past few years. When "Nobody's Child" came out I was very excited and waited anxiously for time and availability to read it myself. All I knew was that this was the first in a series about bioethics, which had been a minor plotline in the Mars Hill books. Laura Ann McGehee is a determined young lady. When her only parent is diagnosed with cancer and taking out a loan against the West Virginia farm which has been in their family for centuries is not going to be enough to cover medical expenses, Laura Ann makes a tough and secret decision. She goes to a fertility clinic and begins taking medication to hyperstimulate her ovaries, so that her eggs can be harvested and she can continue supporting her family through the payments she receives there. When her father dies, Laura Ann becomes the sole owner of a farm that she is going to have to fight tooth and nail to keep. At 20 years old, she feels very much alone. But she's not alone. There's a young man whom she grew up with whom she is suddenly seeing with new eyes. Ian, the game warden, has been drawn to Laura Ann for years. She isn't sure she can ever let him know that she is selling part of herself to keep things afloat. A wise neighbor offers lots of support, but she knows something isn't right with Laura Ann. She can see the guilt which is wrapping itself around Laura Ann's heart. When a stranger shows up at the farm, pregnant with a child who was conceived using Laura Ann's eggs, things change dramatically for our young heroine. That is her son growing inside another woman's body. Through a dramatic series of events, Laura Ann must fight for custody once the baby is born. But whose child is he? The child of the mother who carried him in her body? Laura Ann's child? The sperm donor's child? As the tagline of the book states, "What price will a mother pay to save her only son?" Laura Ann must decide if will risk everything... her reputation, her livelihood, even her love. I found that the book started off very slowly for me. The writing style threw me off, too, as it was far more pastoral than the author's first three books. It suit the setting but also took a little bit of getting used to. While I felt the story took its time in coming together, once it got started it was quite engrossing. At the same time, it was such a good story and written so well that I found myself waiting to finish it so I could draw out the reading process. My one concern as I read the book was that Laura Ann was commended more than once for her "brave" act of donating her eggs. I was wondering how exactly I would approach that when I wrote a review. But by the end there was no doubt where the author stood on the subject and clearly shown to be something not to be done lightly or just for kicks or even for the reasons that drove Laura Ann there in the first place. I was relieved and I hope anyone who reads the book will take its warning seriously. "Nobody's Child" is the first in the "Pandora Files" series from Zondervan. Every new Kingsbury release is a much-anticipated event. I was able to review a pre-release of the last book of the Bailey Flanigan series, "Learning", and was so excited to see the adventures of Bailey, Cody and Brandon continue in "Longing". In this book Bailey has more time than ever with Brandon, as he is filming right there in New York City where she is still performing on Broadway. Brandon is brimming with confidence that his relationship with Bailey is unshakeable and headed towards happily ever after. It is in "Longing", though, that Bailey finally gets the chance to see Cody Coleman again, to sit with him and share their hearts. Who will she choose? While Bailey is seeing God work in her castmates in NYC, Cody is back in Indiana still coaching Lyle high. It's a time for him to make many decisions in his life, including how to react when his friend Cheyenne receives a devastating medical diagnosis. You'll cry and cheer your way with Cody, while Bailey's half of the story will keep you turning pages to see where her heart will land in the end. One of my favorite scenes in the whole book was the very last one, where Jenny Flanigan (modeled after our author herself!) gives a confession to her husband. It was a glimpse into Karen's own heart on how she views the Bailey-Cody-Brandon situation. By the end of "Longing" it seems almost certain who the groom on the cover of "Loving" will be... but we'll have to wait until March to see exactly how it all plays out! The year is 106 AD. Julian is a Roman citizen running from the persecution which has taken the lives of some dear fellow Christians. Cassia is a young mother seeking a new start with her beloved son. T.L. 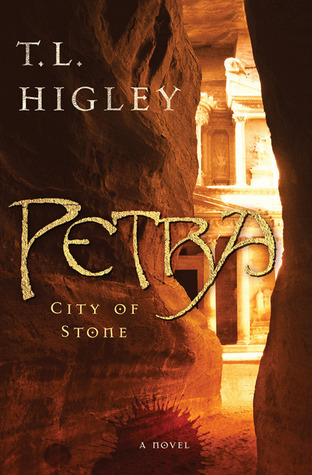 Higley presents us with another masterpiece of historical fiction, using her descriptive style and unique gift to make this ancient city come alive. You'll ride along with a caravan, climb Petra's sandstone steps, scout out the Nabataean palace and ache or cheer with our characters through this journey. I was intrigued to see how Higley handled the spiritual aspect of a book written after Christ's coming. I have loved her novels set at the Seven Wonders of the Ancient World and each of them has featured believers looking forward to the Redeemer. "Petra" has a wonderful focus on the early Church and those who claim the Jewish Messiah as their own. There is a powerful spiritual war ongoing throughout the novel, culminating in a Peretti-esque battle before it is all over. Petra's fate hangs in the balance as a new heir to the throne is discovered and the Roman army marches across the desert to overtake take them and bring them into their empire. I strongly related to the character of Julian. Like Julian, I am an organizer, a natural leader, and by God's grace have a great deal of personal strength. Strength can be a weakness, though, when one believes they can live by their own power rather than letting the Lord guide. How often I've found myself in Julian's shoes, going strong on a plan I've devised on my own without seeking God's wisdom or will. To see where Higley takes our hero was like a personal challenge to myself. I really enjoyed it and have found myself recalling lessons learned in these past few days since finishing the book. It made an impact, and that is the mark of great story-telling. As ever, you know the historical side is covered well when you find yourself wanting to research the location and setting on your own! I've had some time to look things up, both on Higley's own NoPassportRequired website and other places, and everything I found seemed familiar because she had seamlessly included so many actual facts and references that I had assimilated much information just by reading the novel. You can't ask for more than that as a fan of this genre! Higley continues to be a favorite and I can't wait for her next release! Rachel Hauck has written two of, in my opinion, the best Christian chick lit books out there: Sweet Caroline and Love Starts With Elle. Any book of hers automatically gets a blip on my reading radar, and I'd been wanting to read her 2006 and 2007 releases for quite a while now. Thanks to PaperBackSwap (which has come through with some great reads recently!) I was able to at last sit down and read "Lost in NashVegas" and "Diva NashVegas" earlier this month. "Lost in NashVegas" tells the story of Robin, the girl with music living inside of her. She's a born songwriter but her terrible stage fright has kept her singing at home rather than on the big stage. Now at age 25 with a boyfriend who is ready to settle down, Robin figures that the time to give Nashville a try is either now or never and jets off to the land of musical opportunity. Just because she's decided to face her fear it doesn't mean it has gone away. Robin has a struggle each and every chance she has to sing in front of a crowd... and not every struggle results in a success. New friends are found, a temporary job scrubbing toilets becomes available, and time goes by as Robin tries to perfect her art. As her connections with the music industry begin coming together, so do long-held family secrets that are about to change her life forever. This book really is like a long journey. A little too long for my preference; it just seemed to take quite a while to get anywhere. And no heroine should go through three boyfriends in one novel. It was a fun, quirky story but not much more to me. Robin barely even makes a cameo appearance in "Diva NashVegas". Its heroine is Aubrey James, the somewhat reclusive megastar performer who has been topping the charts since she was 18. The daughter of deceased gospel legend parents, Aubrey has been in the spotlight her whole life and even now has trouble seeing who are her true friends and those who are only around her for her fame and fortune. When a former member of Aubrey's band begins spouting her story to all who will listen, Aubrey decides it is time to finally open herself up for media interviews... but only to the local outlets. The Daughters' Fellowship group is back in this sequel to the last book I reviewed, "Faithful". Here our beloved trio of best friends returns, along with two new main characters to teach us about friendship and life and learning how to walk with God. Kelli is a young woman who dreamed of a career in Christian music... until she made a decision that she is sure God could never forgive. Now trying to find fulfilment in other areas, her life seems to be on a slow ride to nowhere. When her outspoken sister-in-law discovers some of Kelli's old songs and decides to make it her business to break Kelli into the music community, Kelli struggles with the desire to stay where it is safe and the faint hope that maybe somehow God could still use her even after all these years. Heather was the woman literally caught in adultery in "Faithful". She feels empty and worthless as she tries to re-establish her life... and then she meets Jesus. The old Heather is washed away and "new Heather" begins a quest to discover how God has redeemed her and all the plans He now has for her. It's a long road, because everyone knew who she used to be. Heather and Kelli become friends while sharing discipleship classes, and together they find strength to begin walking in newness of life. Forgiveness is a main theme in this book, either learning to forgive yourself or someone else, and to choose to look at how God sees each of us. There is nothing in our pasts that He cannot make whole, and indeed the places that we are most ashamed of can be just the ones that God uses most for our healing and His glory. We just have to learn that in His eyes we are each beloved, accepted, and cherished. Just the way we are! I received this book from BookSneeze.com in exchange for this honest review. All opinions are my own. Kim Cash Tate give us a tale of three friends in "Faithful". Cyd is about to turn 40 and never imagined she'd face this day still single, much less spend it as maid of honor at her much younger sister's wedding. Dana discovers that her husband has been having an affair and her world is utterly shaken. Phyllis is a busy mother of four whose husband does not share her faith in Christ and the divide between them only seems to grow deeper each year. Each of these three will have the chance to choose to be faithful -- to God and to others -- as the pages unfold. The cover of this book is so beautiful. It is meaningful, too, as each color of rose petal on the cover comes into play somewhere in the novel. I loved that about it! Another thing I loved was the tight friendships between these ladies. They are each other's prayer partners, support, best friends, and more. They meet regularly for what they call "Daughters Fellowship" to keep each other accountable and hold one another up. Everyone needs people like these in their lives! The subject matter is sensitive, and I would therefore recommend this read only for mature readers. And be prepared that not every storyline will wrap up neatly or the way you expect. I did enjoy it very much, though, and am currently reading the sequel. Be watching for that review soon! One does not have to look long at my CD collection or my non-fiction bookshelf to see I'm a fan of Dennis Jernigan. A huge inspirational force in my life, especially during my teen years, Dennis has helped shape my personal relationship with God in a unique way. I was excited when I heard he was launching into the world of fiction writing and was blessed when he selected me to read and review his first novel, "Captured". The story opens with a teenage boy named Lee who has faced severe bullying. His pain was presented in such a real way that it almost gave me a physical ache as I read. One day Lee is suddenly and mysteriously transported into the world of Bren, where he is no longer a social outcast but rather the son of the king and prince of the realm. Everything is different for this young man - even his Brenolian name, Leonolis! - and he begins a journey of discovery, sacrifice, and adventure. "Captured" is available in ebook form from Amazon. Thank you to the author for my copy. All opinions in this review are my own. I just love it when you can find a series that is good all the way from beginning to end. The “Ada's House” novels by Cindy Woodsmall fit that bill perfectly. Three stories about three lovely and very unique young ladies, and the people who fill their lives. Harvest of Grace introduces us to Sylvia, the oldest of 9 sisters. Although it was by necessity that she learned how to run her father's dairy farm, she truly has a deep passion for the land that will one day become her own. She wants to be a farmer and a wife and mother... until she experiences a deep betrayal and must leave her family home. Being the oldest in a large family myself, I could relate to Sylvia on a big sister level. I know how hard and yet how fulfilling it is when you are the right hand man of your mom or dad. It's tough when there are disagreements and stressful when you share the responsibilities of your home and family yet you're still one of the kids. That's the lot of the oldest child. :-) The joy of sharing or helping shape the life of your siblings, though... you can't beat that! Sylvia is able to find a new home on the Blank farm. Deep in debt, with their only son most definitely not interested in inheriting the land, Michael and Dora are trying to keep their livelihood together. Sylvia is a welcome and valuable edition into their lives. Aaron Blank returns to his parents' home with fresh dreams for life. A stint in rehabilitation has helped him with his alcohol addiction. He's ready to convince his parents to sell the dairy and move into town so he can take care of them while operating his new appliance shop. He is unprepared to find that he will not only have to fight his stubborn father but also the new hired help: the dark-haired girl who is determined to not be driven off of this farm. A story of pain, dreams, and two hearts at cross-purposes. I really enjoyed it and had a hard time putting it down. You can read the first chapter for yourself at this link. And don't worry, we still get to keep up with Cara from The Hope of Refuge and Lena from The Bridge of Peace. Their lives and loves still hold a prominent place as the plot ties up. I received this book from Waterbrook Multnomah in exchange for this honest review. All opinions are my own. Current Mood: life is full! As a huge fan of Jane Austen and other authors in the Regency and Victorian eras, I am always interested in books set during this time period. I'm glad that Julie Klassen and others are bringing this into vogue on the Christian fiction market, a task that cannot be easy since everyone must measure them by Austen, the Bronte sisters, Elizabeth Gaskell and others. They are giving it a try, though, and "The Girl in the Gatehouse" was a delightful read that kept me turning the pages and looking forward to the full revelation of the plot. What charmed me most about "The Girl in the Gatehouse" was that it is a story in layers. We open with Miss Mariah Aubrey being sent away from her home because her reputation has become tainted. We don't know the nature of the scandal nor any of the circumstances surrounding it. Mariah and her former nanny remove to the home of Mrs. Prin-Hallsey, an aunt whom Mariah has not seen in some years. Making a new home in the deserted gatehouse, Mariah soon observes that all is not as it seems at the great house itself. The estate is soon leased out to a naval captain just returned to land after successful years on the sea. It is easy to see that Matthew Bryant is based on Austen's Frederick Wentworth, a trait highly in his favor. ;-) Longing to prove himself to the woman who turned down his marriage proposal four year ago, he hopes Windrush Court will be impressive enough to convince her and her family he is a worthy suitor. The colorful cast of characters is a strong point in this book. Klassen develops each one nicely: the publisher who agrees to release Mariah's novels anonymously, the one-armed manservant who has surprising talents, the residents of the poorhouse just down the road, and others are drawn out and brought to life in such a way that you genuinely care about them. Almost every one has a small aura of mystery about them and that adds greatly to suspense as you try to figure out how everything plays together. This was the best book by Klassen that I have read. It will never be Austen, but if you read it for what it is, it stands up nicely on its own. "Mars Hill Classified" series focuses on astronaut John Wells, Navy Pilot and family man. Known as "Space MacGyver" for his ability to keep things running, John is serving on the International Space Station when a terrorist attack strikes at the heart of the United States' military institutions. In the first book, "The Evidence", John is stuck far away from home and country while extraordinary things are hapening on Earth. A new religion centering on the mysterious Father Race is sweeping the world, fed by false prophet Malcolm Raines. The whole world is fascinated when images begin beaming back from Mars from an exploration vehicle that had died 20 years previously. When FBI agent Terrance Kerry begins connecting the dots on the terrorist attacks, he enlists John's unique perspective to help bring it all into focus. Meanwhile John's wife Amy struggles with the separation from her husband and knowing how to raise their four children on her own. "The Proof" is the second novel and it is the most captivating for me. Even on this second time through I could hardly put it down! It begins with the blast-off of the first manned mission to Mars and has an explosive end which will catch you by surprise. It's about faith and frustration and setbacks... and more about the deeply religious and political happenings on Earth. This book is exciting and emotional and one of the best-written books I've read. In the final installment, "The Return", we jump six years into the future and I always feel that this gets the novel off to a slow start. We have to play catch-up with our characters and get back up to speed with them. New main characters come into play as well, clamoring for their own share of attention. It's a great finish, however, and will leave you thinking about the ethics of many situations that are explored. Wrapping up loose threads and brilliantly tying them all together, "The Return" does its duty in concluding this entertaining adventure. Check out Austin Boyd's website for more information on these books (or his new one which released this month and I can't wait to read it! ), and while you're there watch the interview he gives about the series. Be sure and let me know if you decide to read it for yourself! Who are the truly beautiful people in the kingdom of God? Kim Meeder draws from her life to bring us picture after picture of what matters most: living a life wholly sold out to Jesus Christ. To be honest with you, I've never been a fan of princesses. I enjoy a tea party and dressing up as much as the next girl, but being the prissy one worried about keeping her crown straight did not appeal to me. I'm a doer. Give me the action, let me be around the people leading the charge, and I will be happy. How does this translate in our Christian life? Is it the princesses who are truly beautiful? Or might it be the warriors, bloodied and bruised, who can point and say, "Here I won a victory in the name of the Lord." "Here I gave a piece of my life in order that someone else might live." "Here were words of encouragement spoken so that all of us could gain strength to keep going." Meeder dives straight to the point in this book. She speaks of the burden of sin that can bring spiritual tumors and blindness to our lives. She encourages us to fight against sin with the ferocity of a grizzly bear. She tells of peace that can only be found when we remain firm in our relationship with God. She shares the truth: the really beautiful people are the ones who look like Jesus. I received this book from Waterbrook Multnomah Publishing Group in exchange for this honest review. All opinions are my own. "Giving the Gift of Unconditional Love and Acceptance" -- who does not want a part of that?! Having a number of children in my sphere of influence, and wanting to make the most of each opportunity, I was thrilled to be able to read this book. Originally published 25 years ago, this updated version brings Biblical insight up to today's terms, complete with references to Facebook and Skype! What is "the blessing"? It's a way of letting your child know that you love them, support them, and are there for them. According to Trent and Smalley and their study of Scripture, it is comprised of five key elements: meaningful and appropriate touch, a spoken message, attaching high value, picturing a special future, and an active commitment. Each of these elements are explained in depth in the first half of the book. I was ready to immediately go and put them in practice, so convincing and inspiring were their words! The second half of the book is absolutely wonderful as well, with a whole section focusing on what to do if you did not receive the blessing as you were growing up. Not every child grows up in a happy, healthy home... and even well-intentioned parents can miss the boat by assuming their child knows how they are committed to them, when they've never opened their mouths to actually let them know. I'd say a large percentage of people would fall under the category of "when the blessing doesn't happen" and I found those chapters extremely balancing and important. Offering real-life stories of hope and healing, they point you towards the Source of all true blessing, the One who makes all things new and whole. The authors also discuss the importance of understanding why parents may not have been able to pass on the blessing and how we can turn around and bless them, showing the way for renewed relationships. While "The Blessing" is primarily a parenting book, the authors also show how implementing these elements into your lives can have a positive effect on your marriage, friendships and church body. I would highly recommend this book to anyone interested in relational studies or those seeking healing from a bad home experience. This is definitely going on my "keeper shelf" as a resource to be used over and over. I received this book free of charge from the publisher in exchange for this honest review. All opinions are my own. While reading Elizabeth Camden's new release, "The Lady of Bolton Hill," I kept being distracted by the cover. I had seen a very interesting blog post entirely dedicated to its creation and therefore paid a little bit extra attention to it. There's a woman looking somewhat longingly out a window (what a popular cover pose this is!) and you can see the cityscape behind her so you know the story is set in a town rather than in the country. The woman has her hands clasped together in front of her chest as though waiting and praying for an outcome out of her control to be determined. There is lovely silver scrollwork around the title, and from its nomenclature you would assume the heroine is a lady of privileged position who has always lived in this Baltimore, MD, neighborhood. I found myself wishing as I read the story that the book was actually more like the cover and the title. From the plot itself, it seemed as though it should have been christened "The Worldwide Adventures of Clara Endicott" and showed a woman traipsing about for social justice rather than a pining figure in a window. I mean, I knew something was up the moment the story opened and Clara was in jail in England. Lady of Bolton Hill, indeed! 1) We get into the advertised plot at a good pace. I hate it when the main plot point doesn't happen until you're half-way through the story and have spent every page wondering when it was going to arrive. Elizabeth Camden delivers you there with just the proper amount of build-up. 2) The scenes where one of the characters decides to turn his life over to Christ are very powerfully done. You can feel the liberation of soul and the inpouring of peace which only comes from the presence of Jesus Christ. Very fine job by the author! This book would be right up your alley if you are interested in social politics and historical adventure stories. Unfortunately it isn't exactly what I enjoy but I could see its merits and won't judge other Elizabeth Camden releases on this one alone. Note: I received this book from Bethany House publishers in exchange for this honest review. It would be easy to identify one of my favorite authors by a peek at our bookshelves. Well-loved writer Karen Kingsbury takes up her own section! :-) I was introduced to Karen's "Redemption" series back in 2006 and have been an avid reader and follower ever since. The newest release in the Baxter family dramas, #2 in the Bailey Flanigan series, comes out one week from today. Even though "Learning" will not be available until June 21, I already had the privilege of reading it through Team KK, a program Karen put together which sends advanced copies to those willing to read and review them before release. Somehow I was selected out of the hundreds of fans who jumped at the chance to apply last month and I was SO thrilled!! I practically held a stake-out at the post office waiting for that exciting package to arrive. :-) Reading it was a joy and I felt it was a great chapter in the lives of Bailey, Cody, their friends and family. I loved it!! I thought the title could not have been more appropriate and that there was much growth in the character's lives as we traveled the pages together. For those up to date with Karen's novels, I recommend a trip to the bookstore on June 21st to pick up "Learning" -- or even better I suggest pre-ordering it so that you don't have to worry about forgetting :-) If you've never read anything by Karen, or you have but aren't familiar with the Baxter family, I'd encourage you to begin with her "Redemption" series. That's where "Learning"'s journey started and I wouldn't want you to miss any of the adventures along the way! Meg Moseley's debut novel is a bold story. Miranda Hanford was a new Christian when she was married at age 19 to an older man with less-than-mainstream ideas about living a holy life. Now a young widow with six isolated, homeschooled children, Miranda is fighting for a way to leave her controlling and manipulative church. To be honest, I wasn't sure about this book when I first heard about it. This whole subject is close to my heart, as I'm from a large, homeschooling, often less-than-mainstream family myself, and I can see both the benefits and grave dangers that come along with all that entails. I'm personally concerned about a number of issues addressed here in this novel. The story opens as Miranda begins plotting her escape from her legalistic pastor. Before she can take more than elementary steps she has an accident which lands her in the hospital with serious injuries. Called in to take care of her children is her brother-in-law, Jack, who has not seen the family in 10 years and is shocked to find out Miranda's children are not allowed to have nicknames, have never eaten at McDonalds and do not know who Dr. Seuss is. This boggles his mind and is a challenge as he tries to balance the wishes of their mother against his own experience with youngsters. The writing is rich, descriptive and gentle. I was pleasantly surprised at how the tension was handled; there is not as much fear and stress gendered over to the reader as I thought might be. Rather than being a confrontational novel, this reads more as a plea to carefully consider one's own choices and examine them under what is true and right and Biblical. I also thought homeschooling was held up in a positive light. Will children come to any harm by not having nicknames or never eating at McDonalds? Of course not. Those experiences are not necessary to life and Moseley never claims they are. There's a case to be made that it wouldn't be harmful to let them have nicknames or eat at McDonalds, either! In fact, one of my favorite tidbits from the book is Jack's nickname for Miranda's middle boys. It really injects personality into the story. I would like to give Meg Moseley a standing ovation for being brave enough to write this tale. You can read the first chapter of this book here. Thank you to Waterbrook Multnomah, who provided me this book in exchange for my honest review. If you could take a moment and rank this review, it would be much appreciated. Click here. Thank you! I was first introduced to Sharon Hinck as an author through her "Sword of Lyric" trilogy, which I thought was absolutely amazing. In "Symphony of Secrets" Hinck shows off her versatility as a writer, switching from fantasy to a modern day tale of a professional flutist looking to finally break into the Minneapolis Symphony. Amy Johnson is a single mother and a bit of an amateur sleuth, both of which often put her in uncomfortable situations. She'd much rather lose herself in practicing her music. When the Symphony holds auditions for an opening at the second flute position, Amy hopes she can fulfill her dream and move past the 15-year stigma of needing to choose responsibility over dream. But is her dream all that she has expected it would be? The first flutist is snotty, the conductor is new, the concertmaster is a flirt, and someone is out to sabotage many of the performances! Amy determines to get to the bottom of what is going on, and hopefully save both the Symphony from dissolving and her own trial contract with them. Although I found Amy a character I could not relate to personally, I enjoyed this story very much. The villain is masked in such a way that you suspect many of the characters and can never be sure about any one of them. I also learned a lot of tips about orchestras and musicians which I've now found myself watching for in real life, such as if a pair of violinists are bowing in unison. Very interesting! I'll continue watching for other Sharon Hinck titles to come my way in the future! I am passionate about service. I admire leaders and want to be one myself. Love makes all the difference in both of those areas, so when I saw this title it intrigued me. As did its concept: one hundred 3-word sentences to help us live as Jesus did. Each piece of "three-ology" comes with a paragraph of direction and is followed by 4-6 supporting New Testament verses. I thought it was wonderful that there was so much Scripture included! As I read, I kept thinking this book would be an excellent gift for a new believer who might just be learning who Jesus really was and how we live as His representatives today. Or to the graduate who may need extra encouragement as they set forth on the adventure of adult life, to help keep them grounded and growing. It was a strengthening comfort to me as I read it, and often as I went throughout my days these little sentences would come to mind. This is a fabulous read that any believer could benefit from! Note: I received this book from Thomas Nelson in exchange for this honest review. When Bethany House sent me an e-mail offering to let me review Dr. Marty's “The Whole Bible Story,” I was immediately interested. Back in January I started using a new Bible-reading system which I have absolutely loved – and among other benefits, it has fostered in me an even greater hunger to know more about the Bible. Especially the chronological order of everything. I mean, most of it is pretty straightforward but I've always been a little fuzzy on things like where Daniel and Esther fit into the captivity. What about Jeremiah? So I was thrilled when I had the chance to read and review this title. One thing I'd like to stress is that this is not a Bible translation, nor is it at all intended to replace Bible reading. This is meant to be a help for those who want to know the Bible in a more linear fashion. Dr. Marty takes us through the events of the Bible, but he does not focus on any books related to law, prophecy, poetry, or the epistles. It's more like an action account, or as the back cover tells us, “A Bible story book for grown-ups.” The flow is smooth and very easy to read. I've read some reviews that complained there was not more cultural information included – well, no, this pretty much takes any Bible account and condenses it into a few paragraphs, stringing it together in chronological order. That how it presents itself and that is exactly what it is. I have grown up in a Christian home and the Bible has been taught to me my whole life but I still learned some new things as I read here. Tales that I hadn't quite grasped or details that had escaped my notice. It also answered most of the questions I had, such as I listed above. Those it didn't answer I felt it gave me enough information that I could now go look in my Bible and be satisfied. As ever, you know it's a good book on the Bible when it motivates you to stay in the Bible yourself. That's the true test, and this one passes with flying colors! Thank you to Bethany House for my copy of this book.